Many women suffer from menstrual disorders such as amenorrhoea and menorrahagia. These are two different conditions that may produce discomfort in women. Amenorrhoea refers to absence of menstruation and menorrhagia refers to heavy bleeding. There are different reasons for these two problems in women. Amenorrhoea may be of two types. One is primary amenorrhoea in which no specific cause or reason is found for the absence of menstruation. This may occur due to low haemoglobin in the blood. The normal age for menstruation in women is 12-14 years and girls who fail to get first menstruation by this age may suffer from primary amenorrhoea. In secondary amenorrhoea there is a specific cause or reason. It may occur due to some natural physiological process such as during pregnancy or immediately after the child birth. There are many other causes of secondary amenorrhoea. Menorrhagia is heavy bleeding during the periods. Normally, bleeding remains for 4-5 days bit in some women it may continue longer. Menorrhagia may produce other health problems in women such as weakness, tiredness, anaemia, etc. Abnormal menstrual bleeding may occur in women with imbalance of the hormones. There it is important that women suffering from any type of menstrual disorder should take proper treatment. Menstruation stops when a woman gets pregnant. There is no menstruation for nine months during pregnancy. There is imbalance of the hormones due to presence of other systemic diseases which may cause amenorrhoea. Stress may also cause amenorrhoea. There is effect on the hormones in women who remain under stress which may produce amenorrhoea. Imbalanced diet or reduced intake of dietary iron can also cause amenorrhoea. Some women suffer from diseases such as cervical cancer, PCOS, uterine polyps, etc that may also produce amenorrhoea. Imbalance of the hormones is the most important cause of menorrhagia. It occurs in women who are approaching towards menopausal age. Fibroids in the uterus may also cause heavy bleeding in some women. Intake of blood thinning remedies may produce heavy bleeding in women. Women use intra uterine devices or birth control pills that may produce heavy bleeding. Inflammation of the reproductive organs such as cervicitis, vaginitis, pelvic inflammatory disease and other diseases an also cause heavy bleeding. Women suffering from amenorrhoea may feel weakness and tiredness. There is irritability and lack of sleep due to imbalance of the hormones. Infertility may occur due to absence of menstruation. There is increased growth of hair under the chin and voice also becomes heavy due to increased production of testosterone. There is increased bleeding and periods may last up to several days. There is great weakness and pain in the extremities due to loss of blood. Girls and women suffering from menorrhagia become anaemic and look pale. There is weakness and tiredness. Headache may occur due to heavy loss of blood. Vertigo and irritability may be present. Backache and pain in the lower abdomen is present due to formation of clots and heavy bleeding. Divya Praval Pishti: This is an excellent treatment for amenorrhoea. It balances the hormones and treats the condition naturally without producing any side effects. It boosts up the energy and also ensures formation of haemoglobin to reduce the anaemia. It helps to give relief from different symptoms of amenorrhoea quickly. Divya Kaharava Pishti: This herbal remedy is indicated for abnormal menstrual bleeding. It is a useful herbal remedy that naturally balances the hormones to stop disorders of the menstruation. It increases the strength and reduces the weakness and tiredness in women. Divya Giloy Sat: It is one of the best menorrhagia herbal remedies that provide quick relief from heavy bleeding. This herbal remedy is useful because it balances the hormones naturally. It also increases the red blood cells and haemoglobin content of the blood for the treatment of amenorrhoea. Divya Mukta Pisti: This herbal remedy tends to increase the strength of the muscles. It balances the estrogen and progesterone and decreases the amount of testosterone hormone. It prevents the harmful effects that may be produced by taking birth control pills. It regulates the flow of menstruation by balancing the hormones. Divya Vasant Kusumakar Ras: This wonderful herbal remedy is useful for improving the reproductive functions by balancing the hormones in women. It is the best remedy for different types of menstrual disorders. It may be taken regularly as it does not produce any side effects. Divya Stri Rasayana Vati: This is also a useful and effective natural remedy for the menstrual disorders in women. 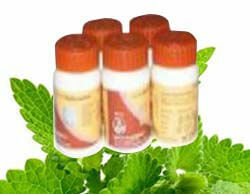 It is a useful remedy for amenorrhoea and heavy bleeding in women. It is also a useful remedy for menopause symptoms. It reduces the stress and other symptoms that are produced due to imbalance of the hormones. Women and young girls should eat balanced diet and should include iron rich foods to increase the amount of haemoglobin and red blood cells. Exercise is also important for reducing stress. Women suffering from mental stress should join yoga and meditation classes to avoid stress. Fenugreek seeds are good for the treatment of amenorrhoea and menorrhagia. Boil one tea spoon of fenugreek seeds in water and drink this water after it gets cooled. Eating a diet rich in fresh fruits and vegetables is also useful for stopping menstrual disorders or for the treatment of amenorrhoea and menorrhagia.